Vegas is home to the biggest celebration for electronic dance music lovers, EDC – Electric Daisy Carnival. More than 300,000 revelers head to the Las Vegas Motor Speedway for the festival, which features art, carnival rides, circus-style performances and all of the top EDM DJs. With dazzling firework shows every night, performers wandering the festival grounds, and huge art installations, the spirit of EDC encourages love, community, and the common love for music and dancing. Bring a water bottle or hydration pack. The full grounds are open from 7 PM – 5:30 AM. Bring a portable charger so you can be sure not to miss any sets if your phone dies! Where is EDC Las Vegas located? EDC Las Vegas is located at the Las Vegas Motor Speedway. When is EDC Las Vegas? 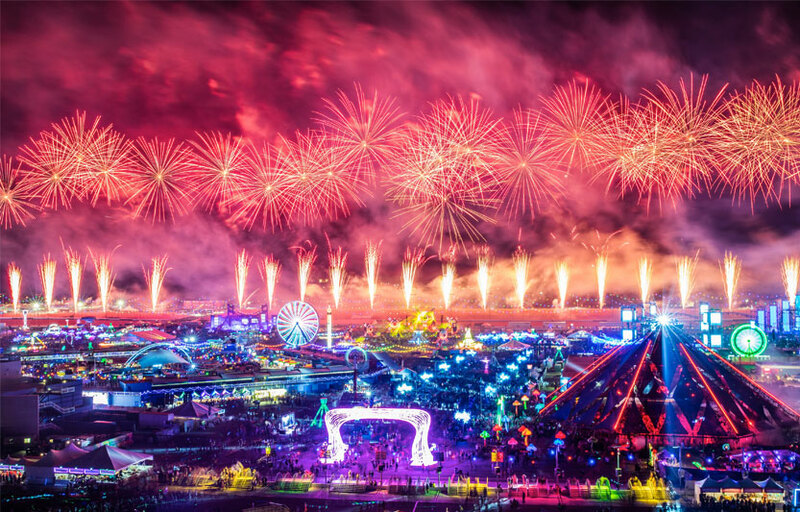 EDC Las Vegas is from May 17 – 19, 2019. What types of ID are allowed at EDC Las Vegas? See what types of ID are acceptable for EDC Las Vegas. When does EDC open each day? Each day of the festival, the cosmicMEADOW gates will open at 3pm, followed by a pre-party & opening ceremony from 4–7pm. Full grounds are open from 7pm–5:30am. Are ins and outs (re-entry) allowed at EDC? Campers with a valid Camp EDC wristband are allowed to leave Camp EDC on foot. Festivalgoers who do not have valid Camp EDC wristbands will not have in/out privileges from the festival to the campground or access to the campground at any time. What are the EDC set times? Are they posted in advance? During the days leading up to the festival, set times will be posted via this site, our social media sites, the Insomniac app, and email updates (sign up for emails at the bottom of this page). Set times will also appear on the festival guide you receive upon entry. Note: The lineup is subject to change. What is the closest airport to EDC Las Vegas? What is EDC’s Camera Policy? Professional photographers must obtain a photo pass using the press submission form. Do not email your request. Photo passes are not required for standard cameras that do not have detachable lenses or handheld video devices under 6″. Professional video cameras are not permitted. What do people wear to EDC Las Vegas? Wear whatever you’re comfortable in! You’ll be spending all night dancing and walking around, so come prepared. Lots of people dress up in rave gear and costumes! Can I sleep in my car or park overnight at EDC Las Vegas? Sleeping in cars in the festival parking lot is not permitted for anyone. DO NOT leave your car in the parking lot during non-festival hours, or it will be towed at your expense. See our Camp EDC guidelines for campground parking rules. Are lockers available for rent at EDC Las Vegas? Yes! Store your stuff securely, and keep your cell phone powered up all weekend long. Click here for a complete list. Totems are also allowed – see the totem guidelines. What kind of music do they play at EDC Las Vegas? 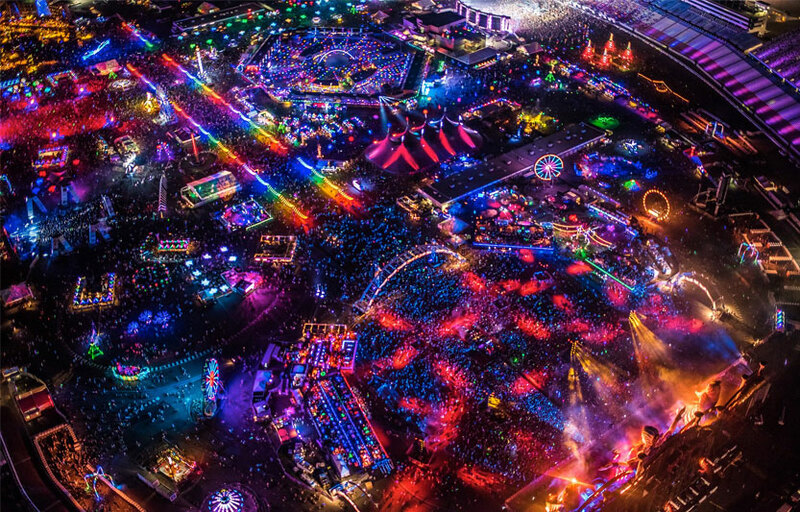 EDC Las Vegas is an EDM festival, which plays everything from trance to techno to deep house. Where can I find more info on EDC Las Vegas? You can download the Discotech app to see upcoming events, and book tables and bottle service for EDC Las Vegas.